The last time I walked alone in a warm active barn with real cows was during my farm week at my Waldorf School in 3rd grade. I learned several important things on that trip. First of all, if you touch the electric gate on a dare you will feel odd for hours. Second of all, the barn was full of all sorts of animals, not just cows - I was particularly taken with the barn cats. Finally, I remember milking, the soft smooth skin of the large udder attached to a huge benign dark form. I remember feeling very small in comparison. 25 years later, as I walked around Calder Dairy in Carleton, I still feel very small and am still captivated by the many animals contained under the rubric of “dairyâ€ farm. 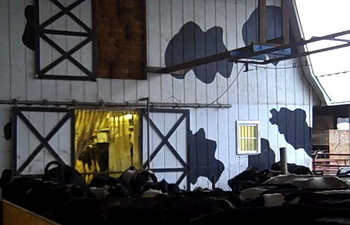 Calder Dairy has been family owned and operated since 1946. The 60 years of experience was evident to me when I called for a tour. The nice woman on the phone responded to my query - “Just show up and walk around. You can ask questions and anyone would be happy to help you. We are an open farm.â€ So walk around I did. There were cows grazing, large horses meandering, cows eating in an open barn, goats pausing in front of the bunny hutch, mini horses scratching themselves on the fence, bulls staring at cows, a new calf suckling its mother, chickens strutting, peacocks stretching, geese chasing, ganders yodeling, and yes, even kittens scampering. Clicks, clucks, thrums, moos, chewing, crowing, meowing, and preening noises filled the air with a cushion of sound. The smell was barnyard, without being overwhelming. A few herd facts before we visit the milching room. Calder Dairy milks 130-140 head of cows. They are Brown Swiss, Jersey, Holstein, and some mixes of the three breeds. Those numbers do not include the pregnant cows as well as the heifers that are not old enough yet to calve. The cows are fed grains and grasses from the land Calder Dairy owns and they are not being given BST (bovine growth hormone). A cow eats 100 pounds of food a day and drinks a bathtub full of water. They produce 6 Â½ gallons of milk. I imagine every breastfeeding woman I know would blanch at that statistic. I spent the majority of my time sitting in the viewing room with a curious rooster captivated and hypnotized by the milking process (I think the rooster was just captivated with himself). The cows were cheek by jowl and patiently waiting for their turn. It looks like a gas station where instead of withdrawing gasoline, cows deposit milk. Like a gas station, the players seemed automatic in their routine. Given that milking happens twice a day, 365 days a year, routine is a good word for it. Three handlers man the 8 spots where the cows walk onto a platform. Their udder is sprayed and wiped and then four suction clamps are placed on their teats. The rhythmic pumping of the machine pulses the fresh milk into holding tanks where it is stored until they take it to their Lincoln Park facility to be pasteurized. I sat for about 30 minutes, in awe of these huge creatures so full of milk. (If you want to meditate for 30 seconds on a cow being milked, here is a video.) Some of the animals seemed older, their hipbones jutting out, almost unable to step up the 12 inches to the platform, yet with resplendent swaying udders the size of large watermelons. Watching those huge lumbering creatures, bred for hundreds of years to maximize return on a farmer’s efforts, I felt in awe at the amount of dedication and work dairy farmers give every day of the year to bring milk to the cereal bowls of America. From those pendulous udders is pumped ice cream, egg nog, cottage cheese, cream for coffee, crÃ¨me brulee, lattes, hot chocolate, on and on. The farm is a perfect place for an afternoon outing, perhaps when it is warm enough that one could sit under their pavilion by the pond and watch the very friendly geese while enjoying one of their 38 flavors of ice cream. If you have a group of 15 of more, contact Calder Dairy for a farm tour, they will let you feed the calves! Here is the article in annarbor.com.